Review by AllTheBestFights.com: 2018-02-18, some good exchanges between James Vick and Francisco Trinaldo but it is not enough to get three stars: it gets two. James Vick entered this fight with a record of 12-1-0 (67% finishing rate) and he is ranked as the No.20 lightweight in the world. He lost to Beneil Dariush in 2016 but then he has won over Abel Trujillo (Abel Trujillo vs James Vick), Polo Reyes and Joseph Duffy. His opponent, Francisco Trinaldo, has an official mma record of 22-5-0 (55% finishing rate) and he entered as the No.17 in the same weight class. Francisco ‘Massaranduba’ fought twice last year losing to Kevin Lee (Trinaldo vs Lee) and beating Jim Miller (Jim Miller vs Francisco Trinaldo). 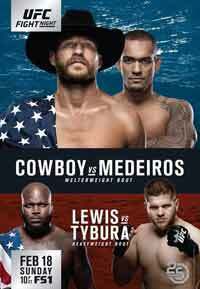 Vick vs Trinaldo is on the undercard of Donald Cerrone vs Yancy Medeiros – UFC Fight Night 126. Watch the video and rate this fight!